I got this book in the mail for review a few weeks back &, well, you know how it goes. I looked through the table of contents & then Bronte or Linnaeus needed my attention. The book got put at the end of my To Do list & I nearly forgot about it. Last night I finally had a moment to read it. Once I started looking at the gorgeous photos & the ideas in it, I couldn't wait to get started on some of these activities with the kids. 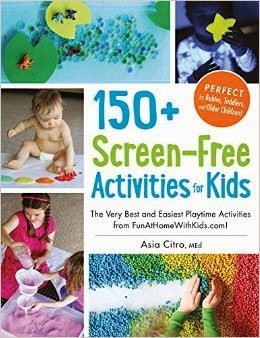 150+ Screen-Free Activities for Kids, by Asia Citro, is essentially a recipe book. It's divided into sections like Slimes, Doughs, & Do-It-Yourself Toys. Each recipe has several variations, like making it safer for babies/toddlers who put things in their mouths, or making it glow in the dark. The recipes use ingredients that you probably already have around your house, or you can easily find, like white glue, or glitter. The activities in 150+ Screen-Free Activities for Kids--finger painting, playing with little figurines in "small worlds", molding dough--are all just the kind of things that kids love to do at any age. Experimenting with colour, smell, texture, movement--the ideas in Asia Citro's book are great ways to encourage kids' natural curiosity to learn through play. 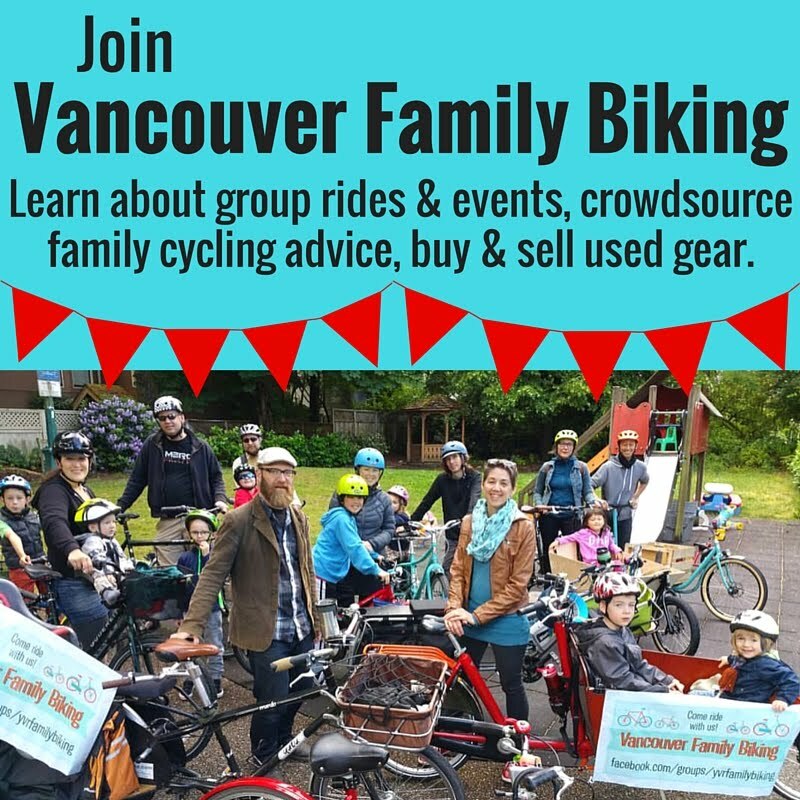 In addition to her book, Citro has a popular blog, Fun at Home with Kids. She's a mother or two & has a Masters of Education with a strong background in science. There are so many reasons to love this book if you have kids. Most of the ideas in the book require very little time to make or set up. The materials required are also inexpensive & many of them are reusable. There are activities appropriate for a wide range of ages, from about six months old right up to ten or twelve. Once your kids are playing with their dough, coloured rice, or dinosaurs in "mud", you might even have a chance to drink a cup of tea! Though, to be honest, you might find like I did that you want to play too. 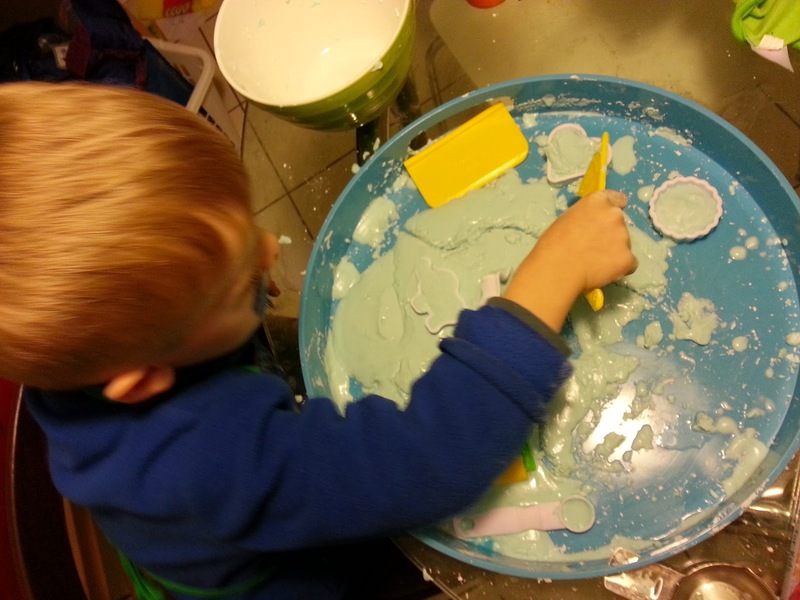 When I made the Gak Dough, I had a lot of fun squeezing it, breaking it, & letting it melt between my fingers. Linnaeus played with it for about an hour, I think. In the past, when I've tried to set up craft type activities with him, he is far more interested in the process than the end product. Not surprising really, as that's basically the definition of play: exploration & enjoyment of process without worrying about making something or getting a specific result. Since the activities in 150+ Screen-Free Activities for Kids are all about sensory play, I'm pretty sure the kids will love them. I kind of want to buy a copy of this book for every parent I know. Elementary school teachers, daycare workers, & preschool teachers would probably love it. You can find it in bookstores, online, or download it for your ereader too! Disclaimer: I was given a free copy of this book to facilitate a review, but was not otherwise compensated for this post.